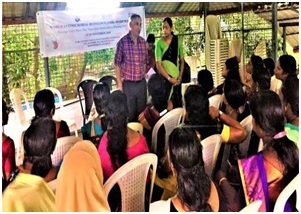 ICAR-Central institute of Fisheries Technology, Cochin observed ‘World Antibiotic Awareness Week’ (WAAW) during 12-18 November, 2018. 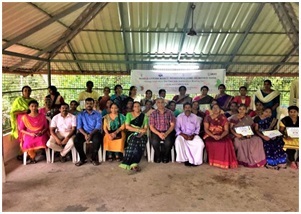 As a part of it a One-day Workshop was organized for the benefit of 26 isherwomen of Kumbalam village, 30 Kilometres away from Cochin on 16th November, 2018. Scientists of ICAR-CIFT who organized the programme included Dr. Suseela Mathew, Principal Scientist & Head of Biochemistry and Nutrition Division, Dr. M.M. Prasad, Principal Scientist & Head of Microbiology, Fermentation and Biotechnology Division, Dr. K.K. Asha, Principal Scientist, Biochemistry and Nutrition Division, Dr. V.K. Sajesh, Scientist, Extension Information and Statistics Division and Smt. T. Muthulakshmi, Scientist, Microbiology, Fermentation and Biotechnology Division. Dr. Suseela Mathew dealt with the topic on nutritional importance of fish while Dr. Asha spoke on the role of fish in Indian diet in which fish is consumed by more than 70% of the Indian population. Smt. Muthulakshmi emphasized on personal hygiene and its importance in prevention/occurrence of diseases. Dr. Prasad described the development of antibiotic resistance due to improper use, low quality antibiotics, without prescription of authorized medical practitioners and how it can impact socio-economic conditions whenever a person is infected with resistant bacteria. This included Disability Adjusted Life Years (DALY). He added that aquaculturists should shun the use of antibiotics for prevention and prophylactic measures in aquaculture that can translate into development of multi-drug resistant bacteria. Translational facility of the talk into local language (Malayalam) was given by Dr. Suseela Mathew. At the end, all the participants pledged that they will not purchase any over-the-counter antibiotics and will take only upon prescription by the authorised doctors. The President Kumbalam Gram Panchayat and Ward Member also spoke on the occasion.